After winning all four Class two opening rounds of the Porsche Club Championship Strasse pilot Chris Dyer was looking to extend this lead and close the gap on overall championship leader Mark Sumpter. After the sweltering heat of rounds three and four at Croft the weather at Donington Park was the total opposite with heavy clouds and with a threat of rain all weekend, that rain came just as the strong twenty seven car filed lined up on the holding area prior to the qualifying season. Dyer had been hoping that the rain would hold off and had also decided to take the gamble to put on new tyres without first scrubbing them in, a gamble that did not pay off. With the changing condition on track this meant that the circuit was greasy in parts and dry on other parts making the all field seam more like a parade lap than a qualifying session. With the new rubber on the 944 S2 Dyer struggled to put the car on class pole for the start of the first race placing him further down the field, third in class and 16th overall, ten cars separated him and class pole going to returning Porsche pilot Marcus Carniel in his 944 S2 leaving Dyer with a difficult task ahead of fighting through the pack to close the gap on Carniel Sandwiched between Carniel and Dyer placed 14th overall and 2nd in class was Trevor Lewis also in a 944 S2. Dyer explained "It was very wet and slippery at the start and it actually dried out for a bit, but then it started to rain again there was quit a few wet patches, dry patches and slippery patches here there and everywhere and going out on new tyres made it even worse so we will have to see what happens in the race". 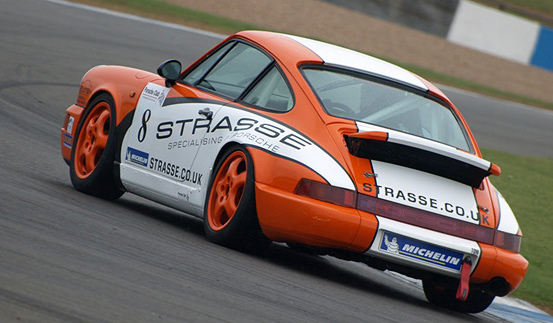 Richard Ellis piloting the Strasse Porsche 993 C2 qualified 10th on the grid ninth in class with David Botterill struggling with the Strasse Porsche 964 putting him down the order in 22nd place 16th in class. With all twenty seven cars lined up on the grid and very little between qualifying times race five of the championships was going to be hotly contested, every one made it out of turn one "redgate corner" cleanly with Dyer making up two places within the field and closing the gap on second placed class two Trevor Lewis. Dyer was soon on the tail of Lewis but Lewis was not going to make it easy for him and an midfield battle soon took place with Dyer looking down both the inside and outside of every corner trying to find a way past. Dyer eventually found a gap forcing Lewis wide and also allowing David Botterill to follow, Dyer now had space to close the gap on class two leader Marcus Carniel, Dyer was soon in touch with the leader, but never quite close enough to try and pass, ultimately finishing 68 seconds behind Carniel and taking 2nd place on the podium. Richard Ellis racing in class one had a busy start to the race making up three positions on turn one, Ellis had problems with back makers from the class two filed but it was Marcus Carniel again who was the thorn in Strasse Racing side blocking Ellis and not allowing him to pass, Ellis crossed the line taking 10th overall and 10th in class. David Botterill piloting the Class one 964 who started 22nd on the grid soon made up places but again was held up by the midfield battle unable to force his way past and close the gap on the leading pack crossing the line to take 13th place and 11th in class. Chris Dyer…"I had a good battle with Trevor Lewis for about seven or eight laps and could not get round him I finally got through and along side him and pushed him a bit wide David Botterill also got through as well so that helped me out and then Lewis spun off but it was too late to try and catch Marcus Carniel so hopefully in the second race I can near him been five places higher up the grid and have a go. But in all the car handled good with the new tires. Richard Ellis…"I had a good start it was very busy on the first corner but I managed to pass a couple of people but then got blocked by Karim Moudi in the 81 car and was unable to pass him, the car got stronger and stronger throughout the race but I had set my tire pressures too high so I had a strong race in the middle but the tires then started to go off, I could have been a lot better and got tripped up by a back marker but managed to gain that place back, I was about 5th then but Marcus Carniel in class two kept blocking me and would not let me pass that put me out of sink and I got over taken trying to pass him but in all a good race. Race two was the last race meeting of the weekend at Donington and the clouds where starting to look a little on the dark side again, track temperature had also dropped a little but luckily the rain held off. The start of the race was a reverse grid that put Dyer five places up from race one along side Trevor Lewis, right from the off it was obvious that we were going to see a strong midfield battle between Dyer and Lewis but thrown into the mix was also Pete Morris in the class one 968 Sport who had won race one that resulted in both Follett and Lewis serving a 10 second penalty. Drama soon followed with Karim Moudi in his class one 933 that made contact with a class two car leaving him beached at McLeans corner. Dyer managed to miss the incident but was then left with a battle between himself and Paul Follett in the class one 968 CS who blocked him for the first four laps, Dyer eventually got past Follett but the class two leader Marcus Carniel was too far in front for Dyer to be able to do anything to close the gap. Dyer pushed to the end crossing the line in second place in class and 10th overall 58 seconds behind Carniel. Mark Sumpter the overall championship point leader dropped points with a 2nd place finish in race one and 3rd place finish in race two resulting in Chris Dyer closing the gap to only 8 points. Richard Ellis put in a strong performance for race two finishing 8th overall and 7th in class, for David Botterhill this was not his weekend finishing in 15th overall and 12th in class. 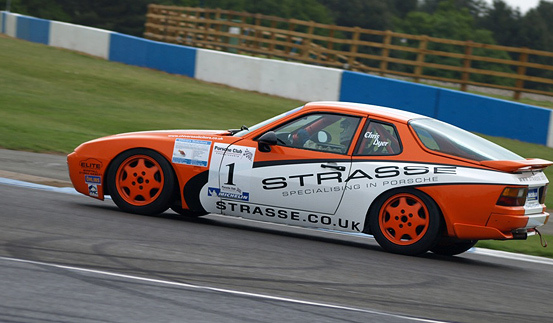 Chris Dyer will aim to build on his success at Donington Park when the Porsche Club Championship heads to Thruxton on the 11th and 12th June for rounds seven and eight.